Hung out with friends on Saturday, always bring my camera and some lights, so I decided to shoot his dinner. 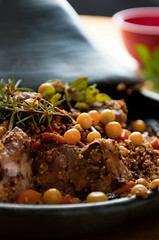 He just bought a Mediterranean pot called a Tangine and made Lamb stew with quinoa, ground cherries and dried fruits in it. It tasted as good as it looks. Lighting - SB900 in a Westcott Apollo softbox high and behind the food. I forgot my reflector, so I opened a white shoot-thru umbrella in the front for fill.